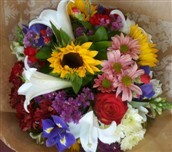 WE SEND AND DELIVER FLOWERS ONLINE TO ALMOST ANY ADDRESS IN THE UNITED KINGDOM OR THE WORLD. WE GUARANTEE DELIVERY OF QUALITY FLOWERS TO THE UK VIA INTERFLORA. Please Note: These illustrations are a guide to style and content, flower colour and type. Foliage and containers may vary according to availability. All prices include delivery. An Interflora relay fee of R120 will be added to the total amount. On peak trading days all prices increase by 60%. SINCERITY A variety of white flowers tied in a bunch. FEELING PINK A bunch of mixed flowers in shades of pink. We protect your privacy! Your Personal and Credit card details is held confidentially and the order form is encrypted and relayed via a 128-bit Secure server. Quality at the best possible price. Send and deliver flowers online to the UNITED KINGDOM (England, Scotland, Wales and Ireland) via Special Occasions Florist - online flower delivery to UK via Interflora.